Thatcher. Guantanamo. Iraq. 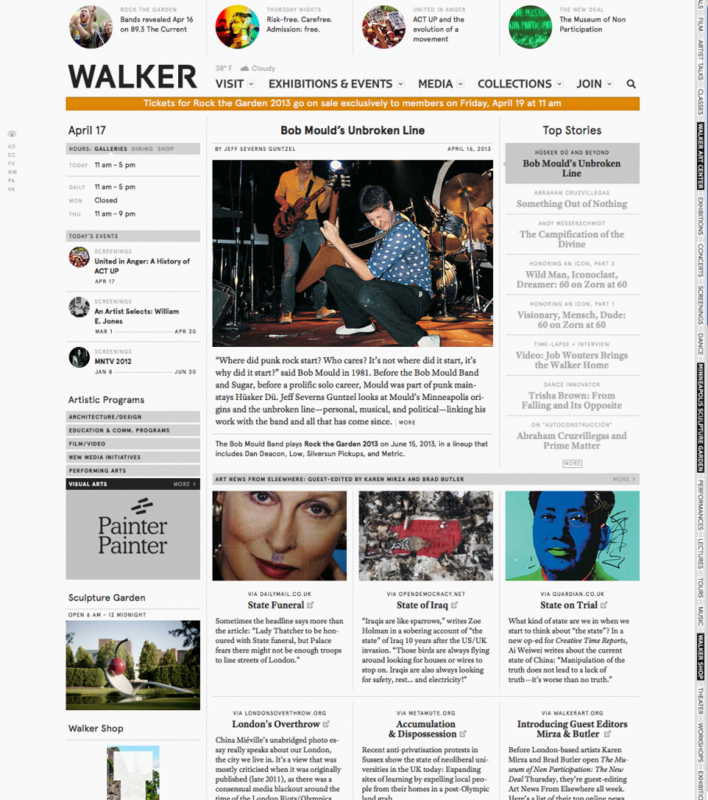 If you were following our Art News From Elsewhere feed on the Walker homepage last week you probably noticed a decidedly more political slant to the section. London-based art duo Karen Mirza and Brad Butler took over curation of the news from April 15 to 19 as part of their just-opened Walker exhibition The Museum of Non Participation: The New Deal, on view through July 14, 2013. As this is the first time we’ve welcomed guest curators of Art News From Elsewhere, we hope to hear from Mirza and Butler about the experience–what themes emerged, how they approached the idea of using an institutional channel to share issues of personal concern to them, what they learned along the way, etc. But in the meantime, here’s a recap of their five days at the helm of ANFE. Recent anti-privatisation protests in Sussex show the state of neoliberal universities in the UK today: Expanding sites of learning by expelling local people from their homes in a post-Olympic land grab. China Miéville’s unabridged photo essay really speaks about our London, the city we live in. It’s a view that was mostly criticised when it was originally published (late 2011), as there was a consensual media blackout around the time of the London Riots/Olympics. Today is the funeral of Margaret Thatcher, a woman who dominated much of our childhood years. In this blog post, Plan C collects texts by five authors which we think do an excellent job of understanding her legacy. This satirical take on UK politics was long one of the most incisive, urgent, imaginative, and rebellious forms of commentary on power. Here Thatcher asks, “What do we call it when people go around stealing other people’s property?” The reply still holds true today. The extradition of UK citizen and poet Talha Hassan to a US supermax prison without any evidence has fallen out of the news, but we feel the discussion around who gets to speak and who gets to be heard needs to still be highlighted. Ahead of our collective performance of The Exception and the Rule tonight, we present this video of Bertolt Brecht in 1947 defending his position in the House Committee on Un-American Activities. In so doing, he simultaneously speaks on the limits of translation. “I’ve been detained at Guantánamo for 11 years and three months. I have never been charged with any crime. I have never received a trial.” Is it any wonder that 35-year-old Samir Naji al Hasan Moqbel would give up hope and choose to starve himself to death? Ahead of the “blackboard conversations” we’re hosting this Saturday by Avery Gordon and Sharon Hayes, we recall Joseph Beuys, who used dramatic actions and lectures in an attempt to change consciousness. During her Saturday Walker visit, Sharon Hayes will reflect on this project (made with David Thorne, Katya Sander, Andrea Geyer, and Ashley Hunt), which looks at the state of exception and questions language’s use politically. Keep up to date with Avery Gordon on the radio when she co-hosts “No Alibis,” a weekly public affairs program that airs every Wednesday morning from 8 to 10 pm PST on KCSB 91.1 FM, the station at the University of California, Santa Barbara.